The headline you clicked on may have sounded legitimate—but it’s 100% fake news. Not true in the slightest. You can see how easy it is to spread misinformation on the Internet, however, especially if you push buttons on issues people feel strongly about. Lots of groups are looking to spread “fake news” to push their agendas. Among them are animal rights activists—who manipulate our love of cats, dogs, and other pets to push an agenda that ultimately tries to scare us or guilt-trip us away from enjoying hamburgers and ice cream or a trip to the local zoo. They often wield videos purporting to show horrible conditions. But the next time you hear about one, ask yourself if there’s more to the story. Here are a few examples that should make you question what you see. Animals Skinned Alive for Fur?! Not so Fast. Consider one video that has been floating around on the internet for years. The horrific video shows someone in rural China skinning an Asiatic raccoon alive. 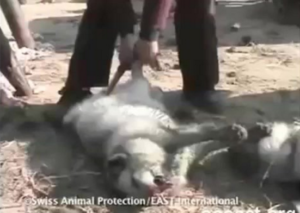 Animal rights activists have used the video as an indictment of the fur industry. That’s fake news. Here’s why. Chinese authorities demanded to know the details in order to investigate it. And the animal rights group apparently wouldn’t provide them. This led many to speculate that the video was staged and that the perpetrator was paid to perform the act. Even PETA has said, “PETA is not suggesting that animals are routinely skinned alive….PETA has never suggested that animals are intentionally slaughtered this way.” That’s because it doesn’t happen. The video is appalling. But so is the refusal to give key details to investigating authorities, as well as utilizing such an atrocity for propaganda purposes. In 2008, the Humane Society of the United States released a video purporting to show cruelty at a livestock auction in New Mexico. But the New Mexico Livestock Board—the law enforcement arm of the state’s livestock trade—investigated and found something different entirely. The only problem was the investigation was hampered because HSUS didn’t send them a copy of the footage despite promising. But it did go to the media to make a big splash. No wonder animal rights activists rush to the media before neutral investigators can judge the footage. Animal rights videos have “exposed” the practice of keeping mother pigs in individual stalls when they’re pregnant. Despite their best efforts to make this practice out to be animal abuse, they omit one key fact: It’s approved by veterinarians. While most pigs are kept in groups, a pregnant sow is a hormonal animal and fight with other pregnant sows when kept in a group. So they’re given stalls of their own, where they can get individually fed and receive individual attention from farm workers and vets. A number of US states have considered laws that would mandate animal rights activists report evidence of animal cruelty to law enforcement within a reasonable time—often 48 hours. There are similar laws that mandate the reporting of child abuse, and for good reason. Yet animal rights groups have vehemently opposed these laws. At times, they have sat on footage for weeks or months before reporting it. If they care about stopping animal abuse, why wouldn’t they want to get authorities involved? We interviewed a former undercover filmmaker for the Humane Society of the United States who wanted to blow the whistle about his experiences. What he saw on farms was generally good treatment of animals—even though that’s not what his organization was hoping to portray.